As one of the leading car export company in Japan, CarUsed.jp facilitates seamless transactions for prospective car buyers planning to import Japanese used cars. We offer a wide selection of used car models and makes that can match, if not supersede, your expectations. Because your satisfaction is our first priority, we use a foolproof system that helps you effortlessly find car models based on your budget. Our expert team is willing to go the extra mile to help you import Japanese used cars without sacrificing valuable time, energy and resources. Japan is home to the largest car companies in the world. Designed to offer fuel efficiency and comfort, Japanese cars are built to survive even the toughest terrains because manufacturers place a strong emphasis on quality and durability. Because of this, many people import Japanese used cars instead of buying a brand new model. Car manufacturers such as Toyota, Honda and Nissan continuously raise the bars higher in the automotive industry as they consistently design sophisticated and robust car models. As premier car manufacturers, these Japanese companies release cohesive car collections that can meet the needs and demands of lower and upper-class consumers. From luxurious car lineups to budget-friendly models, Toyota, Honda and Nissan offer superior quality products and unparalleled services. Over the years, these Japanese companies incessantly dominate the US, Europe and other regions. Intertwining style, comfort and quality, Japanese cars can definitely take the automotive industry by storm even in the years to come. Out with the old, in with the new—the Japanese are pioneers of change and innovation. Their strong desire to continuously upgrade their tools and equipment led to the increasing number of used cars in Japan. In fact, around 150,000 used Japanese cars are sold in auctions every week. As more Japanese cars are auctioned, prospective buyers from different parts of the world resort to buying imported Japanese cars. However, buying alone a used car from auctions is a complex and time-consuming task. Aside from completing important documents, those who are planning to import Japanese used cars also need to obtain a custom clearance for the shipment to take place. As a consequence, the need for Japanese-based export companies increased. Through companies that help buyers import Japanese used cars, more people are able to get access to top quality second-hand cars. As a renowned name in the industry, CarUsed.jp serves you with loyalty and dignity. We are geared towards looking after your best interests as you import Japanese used cars. We give you the opportunity to skip the tedious process and fully enjoy top-of-the-line cars at the most honest and the most reasonable rates. Our expert team uses innovative tools that enable you to optimize your search and make the best buying decision. 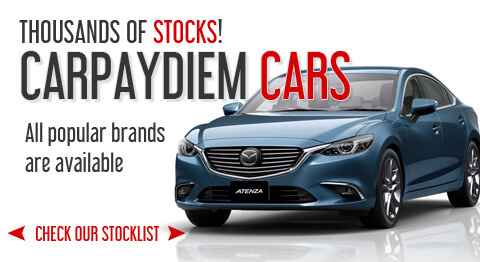 We use a time-tested approach that helps you filter cars by car manufacturer, type and price. This way, you won’t waste valuable time and resources as you look for car models that best fit your specific needs. All you need to do is browse on our site and do an inquiry, so we can help you import Japanese used cars at a pocket-friendly price. So if you are planning to import Japanese used cars, fill in our inquiry form and request a quotation! With us, you can expect nothing but services custom-fit your needs.